In any utility or industrial concentrated solar power plant application it is vital to know the status of your system to ensure continuous reliability and be alerted before an issue arises. The solar concentrator has the capability to be monitored via the solar concentrator SCADA web dashboard. This dashboard is easy to use and provides critical information regarding the solar concentrator, status, diagnostics and energy production from the CPV multi-junction solar cell modules, Stirling engine, and steam engine. The solar concentrator can be remotely configured and allows for immediate set point changes. The solar dish can be remotely controlled via mobile browser or PC which frees the technician from touching the control system. In the event of an alarm or alert, the unit sends out an email to designated personnel. All alerts can be customized according to the notification the user wants to receive. 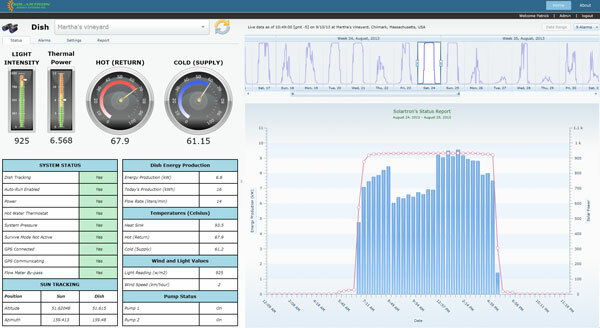 The solar concentrator SCADA dashboard provides a diagnostics overview of the solar concentrator which includes: temperature and pressure status, energy production, etc. At one glance you know the status of the dish. In certain applications such as solar power electricity production (Stirling Engine), energy production reports can be generated for each dish. As well a chart and table is provided to visualize the daily production.